Imagine that after long day tending to patients, a middle-aged nurse feels a burning pain in her knees so intense she can barely walk. For millions of people who suffer from arthritis or other chronic joint pain, this is a familiar story. Right now there are few day-to-day therapies available for these patients, and many involve strong medications that can be harmful over time. If George K. Lewis, a biomedical engineering graduate student at Cornell University has his way, there may soon be another option. Lewis and his colleagues have created a miniaturized ultrasound device that would allow patients to apply ultrasound therapy to inflamed joints at home, work, or even while going about their day. Most of us are familiar with the amazing powers of diagnostic ultrasound technologies in modern medicine, which allow doctors to tell us the gender of a child prior to birth or the condition of our internal organs without exploratory surgery. Doctors have also used ultrasound therapeutically to effectively treat joint pain from arthritis and other ailments without the use of drugs. The drawback to these current treatments, however, is that they can only be administered in a doctor's office or clinic, since the ultrasound devices available are bulky and expensive. Enter Lewis, who, with funding from the National Science Foundation, has spent his time at Cornell focusing on creating smaller and more accessible ultrasound devices for use in medicine. His portable ultrasound device for joint pain, which is now entering clinical trials in association with Weill Cornell Medical College geriatrician Dr. Cary Reid, is about the size of an iPod, and can provide pain relief for several hours without being tethered to a doctor's office. After receiving instructions from their doctor, patients can apply the device themselves and adjust the level of ultrasound intensity as needed. The key to Lewis's success in miniaturizing ultrasound devices is increasing their efficiency. Conventional devices lose about half the electricity used to create sound waves. Lewis has found a way to convert 95 percent of the device's electricity into sound waves. So how do sound waves reduce joint pain? A knee, for example, is surrounded by an area called the synovial sac. Think of this sac as a sponge. 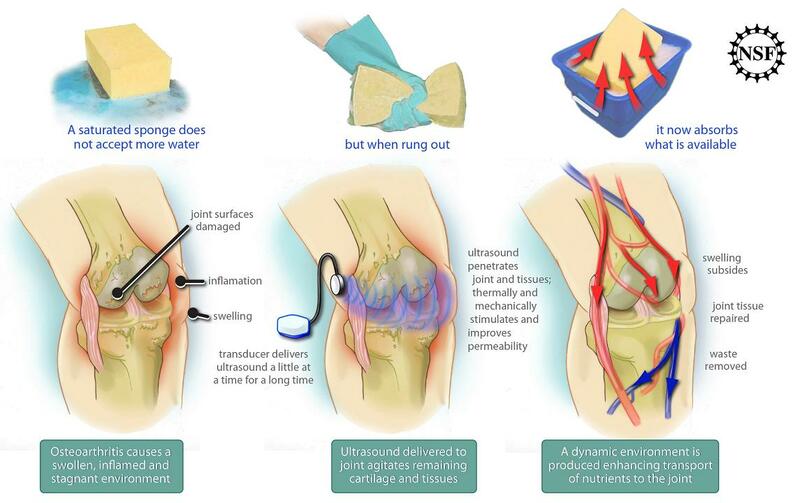 Osteoarthritis causes that ‘sponge' to become swollen with excess fluid and the knee to be painfully inflamed. Ultrasound penetrates the joint and the surrounding tissue, and its waves both stimulate the synovial sac ‘sponge' and increase its permeability, which helps it lose the excess fluid. Once the ‘sponge' is wrung out, swelling subsides, and the body can deliver nutrients to the joint that help repair it. Lewis says there are other potential uses for his small ultrasound devices, including treatment of glioblastoma, a type of brain cancer. During surgery, Lewis explains, a surgeon could remove a tumor and replace it with a dissolving drug wafer, which ultrasound waves would then help spread to kill off any cancer cells left behind. For now, the device has demonstrated its effectiveness in pain relief when used on animals, and if clinical trials with humans are successful, it could become an important tool to treat chronic pain without the use of drugs.